Three thoughts on the Utah Jazz’s 109-104 loss to the Portland Trail Blazers from Salt Lake Tribune beat writer Andy Larsen. Portland scored 39 points in the third quarter. That is too many. Jusuf Nurkic scored 17 of those points. That’s also too many. In particular, the Damian Lillard and Nurkic pick and roll was just killing the Jazz. That makes some sense: Lillard and Nurkic is a uniquely good pick and roll combination. But we’ve just rarely seen the Jazz get beaten so repeatedly on one play — usually, they successfully make an adjustment. Here’s the first assist from Lillard to Nurkic in the third quarter. You can see what the Jazz want to do: they want to have Rudy Gobert up on Lillard to prevent the shot, then have the weak side rotate over and help so that Nurkic can’t get to the rim. Unfortunately, this time, Donovan Mitchell is too late. The idea is that you want to have the help there early enough that they don’t have a straight shot to the basket, and that’s what Kyle Korver does on the second such play: he’s outside of the restricted area when Nurkic catches the ball. But Nurkic just truck sticks him, and gets the basket. Also, Gobert is too slow to recover back to the paint here to help Korver out. If Korver flops here, he probably gets the offensive foul, but no such luck. Assist number three is here. Again, Korver makes it in time, but swipes down on the play and fouls Nurkic for the and-one. He’s just not making a lot of impact on Nurkic’s roll. And here’s the fourth. This one’s different: the Jazz have decided to drop their big to prevent this roll, but Nurkic beats Derrick Favors to the spot anyway and gets the easy layup. Again, this is an extremely difficult play to stop. But the Jazz still could have done better. First, they could have kept Lillard locked over on the side, preventing him from using the screen at all. When they needed to be sure to bring the rotation quickly, and when they did, they needed Gobert to recover to the paint so they could get some help down there. When that rotation did arrive, it needed to be tougher, either standing ground or clearly drawing an offensive foul. And finally, after changing the defense to stop the roll, then Favors actually needed to stop the roll. Obviously, this isn’t everything the Jazz did poorly defensively. But it was indicative of their overall sloppiness defensively, which contributed to the loss. That being said, overall, it’s not as if the Jazz had a horrible defensive game. The defensive rating was 108, below average if only just. But the offense let them down by shooting only 21 percent from 3, making just seven of their 33 3-point attempts. Meanwhile, the Blazers hit eight on 18 attempts. If the percentages were equal, say, at 33 percent, the Jazz would have won by 14 points. The Jazz outrebounded the Blazers 47-45, including a 13-8 advantage in offensive boards. The Jazz did turn the ball over more, 15 times to 12 times, but allowed just four fast break points while the Blazers had 9. The Blazers made threes, the Jazz didn’t, and the Blazers won. 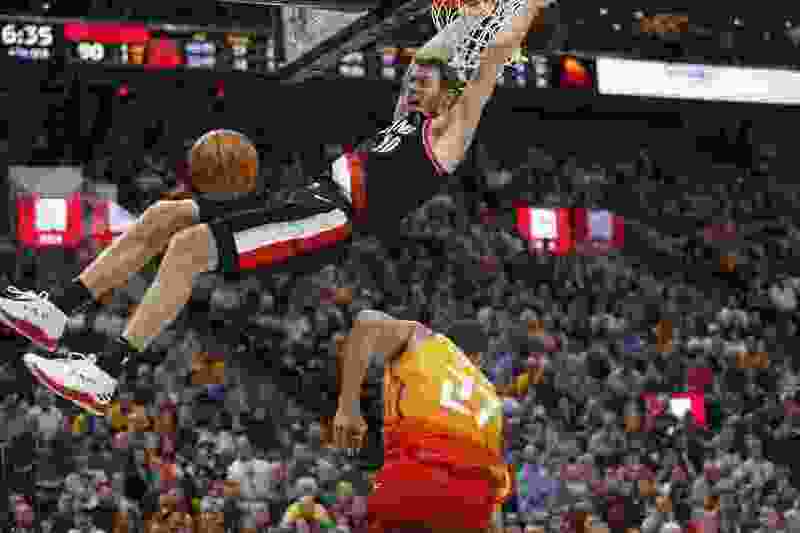 It wasn’t the star shooters for the Blazers that went off, either: it was Jake Layman (2-3 from the field) and Meyers Leonard (2-2) that really killed the Jazz. But that’s how it goes, sometimes. Were the shots equal in quality? Probably not. Jae Crowder took a couple of ill-advised ones, as did Mitchell. But the Blazers' shots weren’t twice as good. And the Jazz did just miss a bunch of open ones in the fourth, from Korver to Joe Ingles, to Royce O’Neale. As Snyder pointed out, “We haven’t shot the ball well over the last few games and our defense kept us in the game. That’s who we are, that’s who we want to be.” Tonight, the defense wasn’t quite good enough. Donovan Mitchell had an up-and-down game. He started 4-5, then went really cold before heating up in the third quarter to carry the Jazz within four points of a potential comeback. Overall, he scored 36 points on 12-28 shooting, getting 10 of those points at the free-throw line. I was really impressed with a couple of his moves that showed an ability to fool defenders. This is his overall highlight video, but my favorite play came at the 54 second mark of this video. He catches the ball, quickly attacking, but that hesitation move sets himself up so well for the layup on the left side. It was really nice. As defenders start keying on Mitchell’s tendencies, he’s going to have to develop counters to get himself open layups at the rim. One move isn’t always good enough anymore, and sometimes, you’ll have to pull up for the one-handed floater, which I thought he used well tonight. But Mitchell’s ability to respond to how his defender is guarding him and exploit that will be key to his ability to keep his efficiency up in the future.